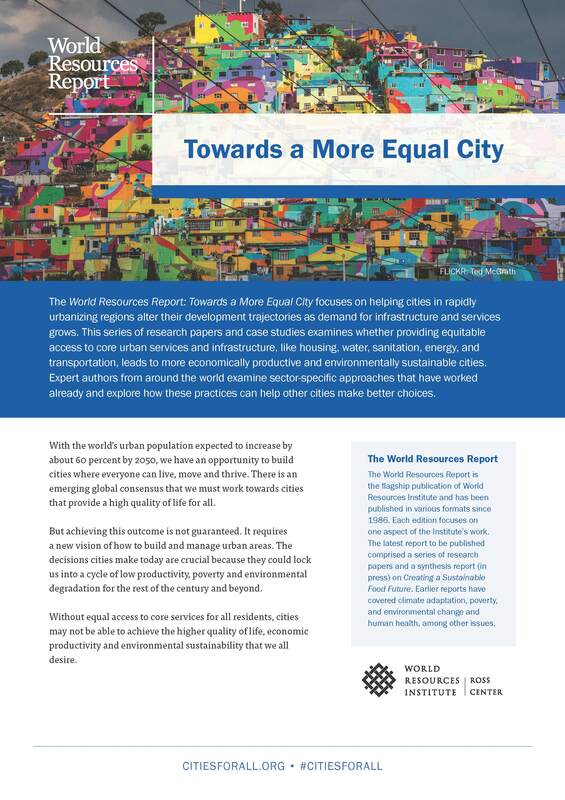 The World Resources Report: Towards a More Equal City focuses on helping cities in rapidly urbanizing regions alter their development trajectories as demand for infrastructure and services grows. This series of research papers and case studies examines whether providing equitable access to core urban services and infrastructure, like housing, water, sanitation, energy, and transportation, leads to more economically productive and environmentally sustainable cities. Expert authors from around the world examine sector-specific approaches that have worked already and explore how these practices can help other cities make better choices. With the world’s urban population expected to increase by about 60 percent by 2050, we have an opportunity to build cities where everyone can live, move and thrive. There is an emerging global consensus that we must work towards cities that provide a high quality of life for all. But achieving this outcome is not guaranteed. It requires a new vision of how to build and manage urban areas. The decisions cities make today are crucial because they could lock us into a cycle of low productivity, poverty and environmental degradation for the rest of the century and beyond. Without equal access to core services for all residents, cities may not be able to achieve the higher quality of life, economic productivity and environmental sustainability that we all desire. Through a series of more in-depth, city-level case studies we ask the question: Is it possible to learn from these cases and use this knowledge to help other cities usher in their own transformation? The World Resources Report is the flagship publication of World Resources Institute and has been published in various formats since 1986. Each edition focuses on one aspect of the Institute’s work. The latest report to be published comprised a series of research papers and a synthesis report (in press) on Creating a Sustainable Food Future. Earlier reports have covered climate adaptation, poverty, and environmental change and human health, among other issues.